The headquarters of Nokia in Espoo in 2008. International ratings agency Moody's on Monday downgraded the long-term debt of Nokia by two notches, to "Ba3", cautioning the Finnish mobile phone giant would likely suffer even deeper than expected losses going forward. International ratings agency Moody's on Monday downgraded the long-term debt of Nokia by two notches, to "Ba3", cautioning the Finnish mobile phone giant would likely suffer even deeper than expected losses going forward. "Nokia's transition in the smartphone business will cause deeper operating losses and consequently cash consumption in the coming quarters than we had previously assumed," the ratings agency said in a statement, adding that the outlook on all of Nokia's ratings remained negative. Moody's had bumped Nokia to "junk" status in June, two months after the two other large ratings agencies, Standard and Poor's and Fitch, but the drop to Ba3 places the Finnish mobile phone maker four notches below investment grade. Monday's downgrade came after Nokia last Thursday reported far worse-than-expected second quarter results, posting a net loss of 1.41 billion euros ($1.74 billion), about four times their loss of 368 million euros during the same period a year earlier and more than double the loss anticipated by analysts. Nokia, which recently lost its ranking of 14 years as the world's biggest mobile phone maker, dramatically changed its strategy a year and a half ago, deciding to phase out its Symbian smartphones in favour of a partnership with Microsoft. But Moody's said it was disappointed with Nokia's outlook and cautioned that its new Lumia smartphones, which the company is counting on to help it survive stiff competition from RiM's Blackberry, Apple's iPhone and handsets running Google's Android platform, were loss-making. The ratings agency also stressed there was no guarantee Nokia's highly anticipated Windows Phone 8, set to launch later this year, would help it get back in the black. "A return to profitability in the Devices & Services (D&S) segment on the back of smartphones with the Windows Phone 8 mobile operating systems is by no means assured," the agency said. Nokia meanwhile said it was disappointed with the downgrade, but insisted in a statement that "its impact on the company is limited." "Nokia's financial position remains strong," it stressed, pointing out that it as of the end of June had a net cash balance of 4.2 billion euros and a credit facility of 1.5 billion which it can count on until 2016. 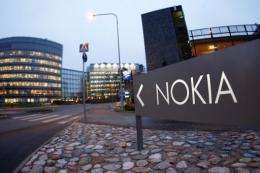 Following Monday's announcement, Nokia saw its share price drop 3.02 percent to 1.38 euros a piece in afternoon trading on a Helsinki stock exchange down 3.04 percent.